You could hardly find two more different personalities. Washington was incredibly disciplined and was able to manage several successful businesses simultaneously. Posey was a heavy drinker and a total failure in business. His debts became so serious that he was actually thrown in prison. Still, Washington liked to gamble at cards with Posey, and for a few short years, it seems they were fairly good friends. As Posey's financial standing became increasingly precarious, George Washington offered to buy the land that bordered Mount Vernon. But Posey was as stubborn as a mule. He made Washington rent his seven acres of land for more than two years before he became so poor that he had no choice but to sell. Posey also sold Washington his house, his ferry, his horse, his saddle and his bridle, all for 50 pounds sterling. The lease for John Posey's land was especially important to George Washington because it offered a convenient docking place on the Potomac River. To soften the blow, Washington provided his warm brand of Mount Vernon hospitality for three days. Then on April 7, 1774, John Posey left Mount Vernon for good, never to be heard from again. 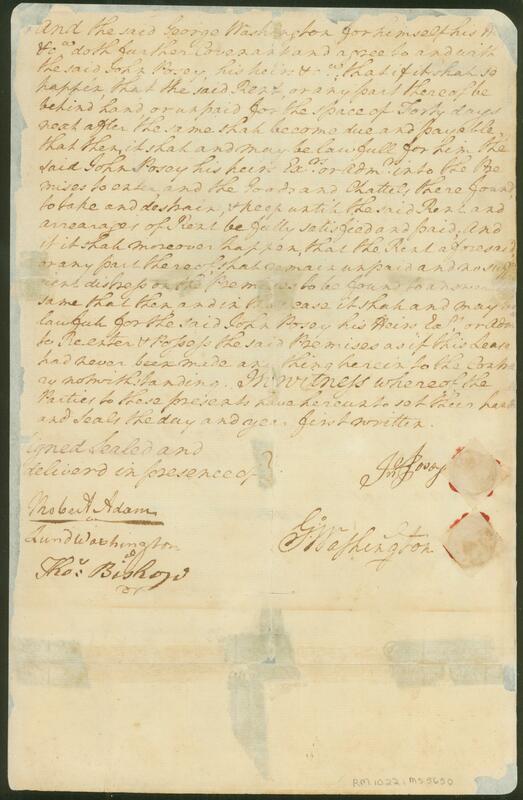 This document, written by George Washington and signed by him nine times, is his agreement with his neighbor, Captain John Posey, to lease seven acres of Posey's land. Of the several hundred 18th-century manuscripts in the Mount Vernon collection, this piece has the most original signatures of Washington, as well as the much more rare signature of his long-forgotten neighbor John Posey. Bruce Waldack, founder of Digital Nation, the firm that helped to formulate Mount Vernon's award-winning website in the late 1990s, donated the original lease which includes nine Washington signatures. "This document helps to tell the story of Washington, the real estate investor, and Washington, the consummate dealmaker," explains Barbara McMillan, Mount Vernon librarian and manuscript expert. "It shows how the pieces of the Mount Vernon estate were put together by a master builder of the first order." "We covet original manuscripts that reflect Washington's interests and personality, and the relationship between Washington and John Posey is a truly fascinating one," notes Dr. McMiUan. "It is also encouraging that a leader from the high-tech industry has demonstrated such a strong interest in American history." George Washington traveled far and wide during his remarkable life. See all the places that he visited in our new interactive map.